The Ark is expected to create hundreds of jobs for people in the area, but has faced heavy criticism for refusing to hire non-creationists. Noah’s Ark has been rebuilt. It stands, of all places, in the rolling green hills of Kentucky. From an outsider’s perspective, it seems a strange idea to construct a gigantic sea vessel in the middle of America’s land-locked heartland. But this wasn’t some madman’s pet project – it was carefully planned out by an Australian named Ken Ham. The Ark is part of his brainchild: a giant Christian theme park that will help spread fundamentalist biblical teachings. Ken Ham posing in front of his creation. Ken Ham is the founder of “Answers in Genesis”, a group that espouses strict creationist views. He believes that the earth is 6,000 years old and that humans lived alongside dinosaurs. After visiting numerous museums, Ham became frustrated that they “were all totally from an evolutionary perspective.” That’s where he came up with the idea to build his own theme park, complete with a museum dedicated to the creationist perspective. The Ark is built to be an exact replica of the version in the Bible. Standing 51 feet tall and 500 feet long, it holds 120 separate animal pens (though no live animals). It cost over $100 million to build. Notably, the Ark’s animal pens also feature dinosaurs. Contrary to evolutionary theory, visitors walking through the exhibits can see a baby stegosaurus alongside pigs and cows. So far, the theme park has proven incredibly popular. Crowds come from all over to see the massive structure, and caravans of school buses can be spotted heading there for field trips. According to Ham, the Ark is projected to attract a million visitors in its first year. 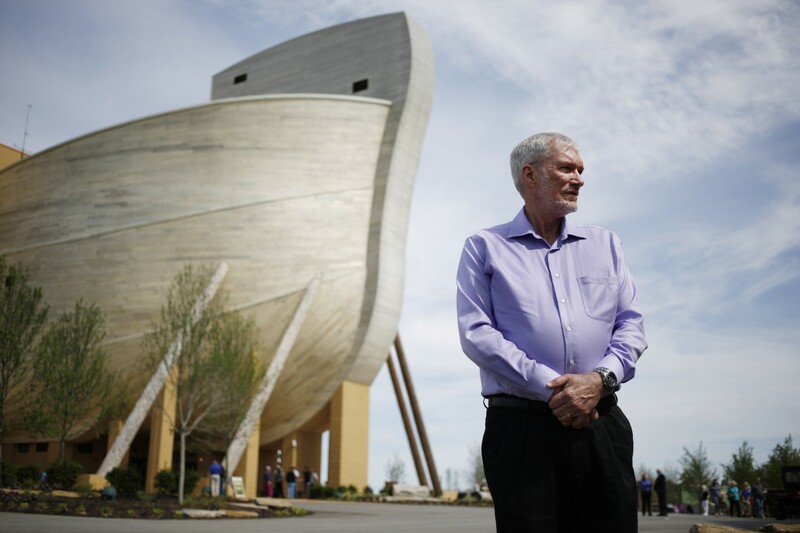 Large as the Ark may be, Ken Ham says his vision extends far beyond the popular exhibit. His team has already launched into a 12-year plan to expand the theme park to hold 80 individual structures. Perhaps the most interesting idea coming down the pipe is a thrill ride styled after the 10 plagues. Riders will experience each of the 10 plagues unleashed on the Egyptians, from swarming locusts to thunderous hailstorms. This much-anticipated attraction is expected to be a hit. A child examines a dinosaur cage on the Ark. As you might imagine, Ken Ham’s theme park has also been the source of some controversy. For starters, the state and local government gave Ham a number of tax breaks and funding deals to lure him into the building the park in Kentucky. Critics say that since it’s an evangelical institution with the stated goal of teaching creationism, the state had no business getting involved. Critics are also concerned about how theme park caters directly to children. Teaching them that dinosaurs and humans walked the earth together might have consequences down the road, they argue; creationist beliefs don’t hold much water when you get to college or head out into the “real world”. Although the Ark is expected to create hundreds of jobs for people in the area, it has also faced heavy criticism for excluding potential new hires based on their religion. Indeed, in order to get a job there, employees must sign a formal “statement of faith” attesting to a sincere belief in creationism. In addition, applicants must disavow homosexuality and gay marriage. What do you think? Is the Ark a state-sponsored tool for converting non-believers, as opponents assert, or just a unique twist on the traditional American theme park? How many cubits did you say ??? It’s a theme park people, in competition to all the other theme parks across the world … havto give him credit to build that ark!!! Woweeee… enjoy it! Apart from the extraordinary feat of building this example of supposed history, ( Big Kudo”s!!! ) I am fairly sure Noah would have a larger a overhanging roof to keep the rain out, and water relief holes at the outer walkway to sluice the water from the waves. Also, would one not have provision for even a small sail to find a direction both to stabilize the Ark as well as to find land later? A rudimentary rudder, perhaps? If this Ark was sideways to the waves even “dinosaurs” would be smashed against the walls and cages!!! And I am neither a sailor nor an engineer! It looks great, but not reality! Rudder? you do t need no stinkin’ rudder. When I watched the movie (lol) the ark was being tossed about in mountainous waves. Believe it or not there is a theory in seamanship called the ‘do nothing theory’. Used when the sea state is so confused one simply does nothing and let nature run its course. Those poor dinosaurs. LOL….That was a bad movie, Really Crowe should have walked away from that script. The ark most likely had what is called a “sea anchor” to keep it pointed into the waves, and ballast in the hull, along with stone anchors that hung down fifteen or twenty feet deep all along the sides, to help stabilize it. If he wants to spend his money on this (and other) parks, based on creationism, that is his business. But he should receive no governmental support in the form of tax breaks, revenue, or any other support. And while i feel he can set whatever standards he wants for his employees, as long as all of his advertising for jobs is explicit, he has no right to create any restrictions on those who go to see the park, as it is open to the public. In essence, it is a form of entertainment church. As an aside, has anyone called him to task about the fact it is impossible to have 2 of every living animal in such a small ark? But Evolution, which is just a theory and not a fact, and may be just a Myth, can receive all the funds it wants? So what is commonly accepted is okay? Scientific theory isn’t “theory” as you think it is. Theory is based on the scientific method and is actually scientific fact. “Google it” sometimes as it appears you do have a computer. Like the computer models that showed the polar ice caps would be gone by 2013…actual scientific fact… like gender only existing in the mind… like questioning if an unborn baby is a human life…like believing in Sasquatch and extra-terrestrials…that kind of scientific fact. You have nailed it and shown a true lack of scientific knowledge. Belief, fact, questioning, and knowledge are not the same. Ask a scientist. Lance, by saying, “Ask a scientist,” you show that you are not one, yet you pretend to have scientific knowledge. How is that possible? There aren’t any true scientists on here, because we are supposed to be dealing with metaphysics and esoteric stuff, and they don’t lend themselves well to science. As it is, it is mostly fad and politics discussed here, and that may be true with the pseudo-science which YOU call science. Alan, if something can be proven and demonstrated, repeated with consistency in experiments, then it can be called scientifically proven fact. If not, it remains a theory or a hypothesis. Just thought I’d enlighten you that much. You don’t seem to recognize the difference between theory and fact. BTW Lance, my darling Wife is an Environmental Biologist, So if I need to add science to my explanation I have the most beautiful scientific journal on Earth. Her name is Mary. When that resource is not sufficient, she knows where to point me. At the same time, she and I do not always agree. but she is objective enough to listen, and question. You can disprove evolution with the old question: Which came first, the chicken, or the egg? Chickens come from eggs, and eggs which become chickens only come from chickens. They do not come from any other bird. So, the chicken was created. Had to be. It is so simple and logical, and yet your programming makes you think it was something else that took millions and millions of years, of which there is ZERO evidence. Not missing evidence. ZERO evidence. Yes, Darwin saw finches adapting to their environment, but they didn’t become a different kind of bird, or a mammal. Dogs can be bred for type and horses, but dogs will not become bears or cats. Cool Tom thanks for the input. However the fundamental separation was to protect the Churches from the state, and the People from a Theocracy. I guess that is what you mean. That does not exclude a non=for-profit, from receiving state funds. Ken Ham’s Arc is in fact not a church. Plus there are programs out there that are run by churches that receive federal, state and other grant funding.They just have to keep with in the guidelines of the fund. Like any grant fund. Yes, evolution is a theory, just like gravity. A scientific theory isn’t something that was pulled from thin air. It’s something that we know exists, but we aren’t sure of the exact mechanism behind it. Scientific theory is something that can be tested and either proven or dis-proven. “Deus Vult” (God Wills It) is neither scientific, nor is it proof. CREATION: proves there is a CREATOR. Nothing comes from nothing, but everything comes from something. Science confirms that matter has not always existed. LIFE: demands a life-giver. Life cannot come from the absence of life. It is produced by other life. That is science. LAWS: come only from a law-giver. The properties of matter are governed by laws. The matter itself cannot create law. DESIGN: demands a designer. All The most prominent scientific minds recognize that all known creation has a design to it. The symbiotic relationships that exist testify that what we can see and touch and feel has INTELLIGENT DESIGN TO IT. Those of us who believe in God as adults do not believe because our parents or school-teachers or pastors told us to believe. We believe because we think, we observe, we study, we evaluate what the “experts” tell us and compare it to what God tells us, and judge by the fruits. Scientifically speaking, is it better for us as a society to practice polygamy and single-parenthood, or would we be better off with monogamy and mother and father households? Would there be less disease and emotional stress under the way people want to behave, or the way God tells us to behave? Now, I’m not saying that science tells us to fornicate without inhibition and create children who do not know their parents. I’m saying science is not smart enough to see what is obvious, but God is, and that people should also be that intelligent, regardless of what science says. God is not really subject to trends or politics, but science definitely is. John O. – That is the best retort and explanation I have ever read. Thank you and God bless you. Very well stated. Amen. Sadly, the non-believers are blinded by lack of faith and the great deceiver of this world. Their eyes are closed and their ears will not hear, their hearts will not receive. Only God and the Holy Spirit can change that by granting them faith. They must open their hearts and minds to receive faith. If they choose to not believe or follow Jesus, that is their right. I fail to understand why people who don’t believe or profess to care what Christians believe…. continue to try desperately to be accepted by trying to change Christian values. Any enterprise should be allowed tax breaks. 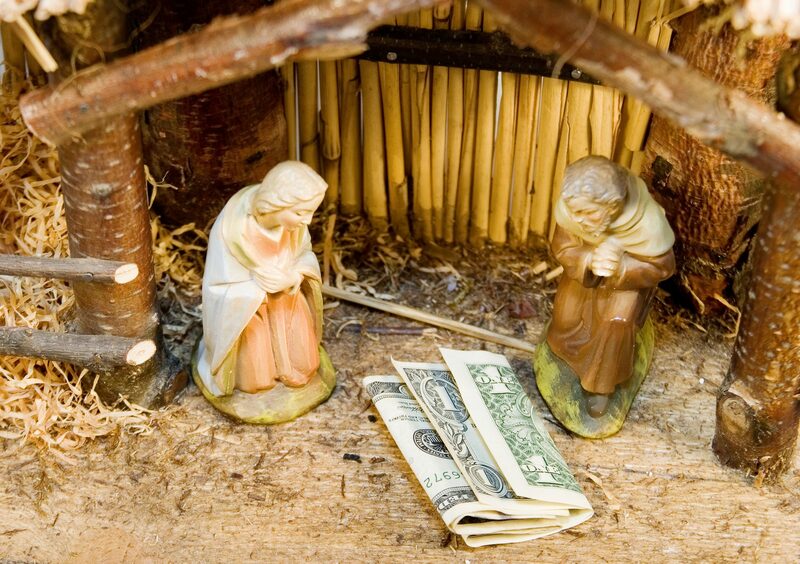 All churches receive tax breaks when non- profit, etc. it has nothing to do with separation of church and state. That separation refers to church not ruling over government only. It is no different than a LBGTIQ business receiving a tax break. There are plenty of those also. I condemn no one! I will not receive condemnation from non-believers either! I have a science degree and yes, I believe in Creationism!!! Having trouble with your logic – in your statements you refer to scientific facts and then bash them. Our views of God and science change but to pit God vs science is a waste of time and energy – the subject was if a state should fund a religious view. And the conversation has turned into God vs. science – what a pity. I have always looked at like this. Science was created by man. And like everything created by man it has flaws. I would rather place my faith in Good, than man. Creation does not prove there is a creator. That is self-fulfilling evidence which is just a debate tactic that holds no water. Science has shown that in certain conditions things can just “appear” that were not there moments ago. Life does not demand a life giver. We just have never encountered life at the moment of it’s creation. Everywhere that we can exist (Earth) already has life on it so that makes it seem as though life must have a creator. Laws are simply an observation that nature operates on events which are consistent & predictable. They are an observation, not a creation of a law-giver. Humans need laws because our behavior is not consistent nor very predictable. “Law” is a word we created. Nature does not need laws… it simply evolves following consistent & predictable actions. Design – Again, we attribute a human description to things that have simply evolved to be what they are now as they followed the “laws” of nature. I would argue that we are not created in “his” image but rather we created him in our image in an attempt to explain what we observe but do not understand. He exists to fill in our lack of understanding. As we learn more we need him less to comprehend the universe with us in it. Brian, Brian, Brian. If you read your own paragraph, you should be able to see the HUMONGOUS contradictions in what you write. Then you say there is no design, we just attribute the WORD design to it, or LAW, we just attribute the law to it. You are partially correct. WE ATTRIBUTE THOSE PROPERTIES TO CREATION BECAUSE OF SCIENTIFIC OBSERVATION. Life ONLY comes from life, Brian. That is a scientific fact, proven, provable, demonstrable. It cannot come from any other source. You are just stubbornly using juvenile arguments to deny what is right before you. You know, we say the sky is blue, but blue is just a word we use to describe a color, so it isn’t really blue. If we called the color we now call blue, if we called that color scratchy, instead of blue, then we would call the sky scratchy, instead of blue. BUT IT WOULD STILL BE THE SAME COLOR. That is how silly your denials regarding creation, law, and design are. Now, before you start with more silliness, everyone here knows that the blue we see when we look up is not the physical background of the heavens but basically our atmosphere reflecting some of the light that comes from the sun, showing up as blue. No, actually gravity is a law of physics. Proven. Evolution is still a theory because it is not proven, just suggested by the available evidence. You have misunderstood the meaning of the word “Theory” in science. But never mind. I’ll apply your understanding of the word to the Bible and point out, then, that the Bible is just a theory. Now, the difference between one theory and another is evidence. There is evidence — overwhelming evidence — for evolution. There is no evidence whatsoever for the truth of the Bible. There is evidence for change in lifeforms, but not the additional information needed to achieve “molecule to man” evolution. We all use the same facts, but we interpret them differently. Evolutionist like to argue the definition of theory, but fail to give real evidence for their beliefs in evolution. Their theory is lacking the evidence they claim and are unwilling to accept the lack of it. Obviously they are not abiding by the scientific method which allows questioning theories and evidence, because science is always changing with new evidence and models. Science does not always change. E-MC2 has not changed. The gravitational constant has not changed. Pi is till the method for calculations involving an arc. Evolution is a fact. We are still uncertain of all the rules / processes involved which makes it a theory. They shall keep testing the theories but at some point a theory does become a known and predictable constant. Again, someone is speaking about things they do not know. Bob, there is PLENTY of archaeological evidence that the Bible is a very accurate historical document. Granted, Genesis does not satisfy humanity’s thirst for understanding of its origins, but the books of Joshua, Judges, the Kings and Chronicles particularly are loaded with history and geography that has been verified time and again by archaeology and comparison with extra-biblical historical documents. I would suggest that you are throwing out the baby with the bath-water. To say “There is no evidence whatsoever for the truth of the Bible,” is a blatant falsehood. Nothing real can be threatened, nothing unreal exists , here in lies the peace of God (reality). Your defensiveness shows your lack of discernment. If you notice it says that Noah shall bring a male and female, and every living creature basically 2 of each after their own kind. So in response to your question about 2 of every living animal could fit on the Ark, the answer would be no, but if you take it in the context of what God was asking of Noah he said to take the canine kind, which includes the coyote, and domestic dogs, the feline kind, which are cats, includes the tiger, and the kitten, and then you include the humankind,etc. Our dog is the same kind as theirs. These differ in degree rather than in kind. He is a strange kind of hero. Well, if rain (fresh water) fell for 40 days and forty nights and covered the earth saltwater fish would die, wouldn’t they? Yup, he needed a fish tank! You are only thinking of how fish are now and not how they were before the flood. the way speciation happens could allow the surviving fish kinds to repopulate the world with either type as they had the genetic information to accommodate fresh or salt water. In other words, the fish did not need to be taken on board. Even more. Clean beasts were to be on the ark by sevens and all other beasts by twos. I’m glad someone pointed that fact out. It is the common concept that the animals entered the Ark in pairs. The door was only so wide, but perhaps traffic control. Yes, but assuming this occurred only a few millenia ago; how would you explain the amount of genetic variance today? I would explain it by saying the scientists don’t know how long genetic variance would take, and each time it occurs, it slows down. Time to realize that the story of Noah is just that…a story. Not fact. Do you believe in Harry Potter’s magic as well? And how do you account for such a huge spectrum of genetic diversity in species? It is understood that all humans came from one kind of human. Yet we are all colors, shapes, and sizes. All dogs came from the wolf, and yet, they too are all shapes and sizes. What was the question? Sorry John, but science isn’t your forte. Science now seems to believe that there are Neanderthal genes in Homo Sapiens. You know, thinking man, the one who spends way to much time on frivolous discussions that don’t produce anything of value. Apparently it is not your forte either, Thomas, but you seem to think that Neanderthals and Homo Sapiens are different. They are able to interbreed, therefore they are the same. If they were not, they would not be able to breed. Humans cannot breed with any other creature, even though some of our Middle Eastern cultures frequently try. Sure, a donkey can breed with a horse, or vice-versa, but the offspring are usually sterile, and if not, they are not genetically viable long-term. The same is true of grizzly/polar bear hybrids, and nearly any other. All kinds of dogs can interbreed, and many kinds of cats, but of course, cats can’t produce offspring with dogs. That should inform you that Neanderthals (a silly nickname given to certain TRIBES of humans) and Homo Sapiens (A presumptuous nickname elitists gave to themselves) are the SAME. Just some are prettier than others. Religious people too often ignore science over their own beliefs. That ark could have NEVER happened. Its just a story like many in the Bible. It is impossible to recreate a whole population from 2 individuals. That is pure caca. Also a dinosaur in the Ark? that is even more caca I’ve seen in a while. Why bother to explain, Christopher? The blind will not see. The deaf will not hear. The heartless will not feel. Only Jesus Christ can open their minds, hearts and souls to the truth. But, they refuse to receive him. Even small stores set restrictions. Such as you can’t come in without shirt or shoes. So they have every right to have restrictions. Yes full grown animals would have been a problem. Very small animals of their own kind, would have made things much easier. Open the book of Genesis my friend. Read it for yourself. Apples to oranges -without shoes and shirt was health concerns related – restrictions concerning employment would be a employee rights concern. Many have health concerns re homosexuals spreading diseases like AIDS! Why would someone who doesn’t believe in the park philosophy want to work there?? I’d like to make a small correction here, Tom. The scriptures do indeed say there were two of each UNCLEAN beast, but SEVEN of each clean beast. (Genesis 7:2,3) Most people do not realize that, because they do not actually read the Scriptures they claim to believe. They think that stuff didn’t exist until Moses. When the ark landed, Noah sacrificed one animal for each kind, but if you only have two, you can’t sacrifice one. Also, he knew better than to sacrifice a pig or a dog, anyway. Now, as to the number of creatures on the ship, perhaps there are more species today of, say, camel than there were then. We have two-hump camels, one-hump camels, the alpaca and the llama, and at least a couple others. What if he only had two of whatever was the original camel, and these others have “evolved” from those? All the different kinds of dog evolved from the wolf. All the different kinds of humans came from Noah and his family. I mean, if any of that is true. Of course it would mean that species evolve much more rapidly than science says, but a lot of that depends on environment. It still would NOT mean that one life form evolved from another, less-developed one. Just stuff to consider. There was jobs made even if you don’t believe. I would say start talking to the Lord how so many animals fit in the ark. He is the only one with the answers. I understand by what your saying teach people to talk with no morals and hate. He wanted standards that the Lord told us to live by. Are we perfect no. The only one in the end to judge is God for me and you. So I can’t judge you and you can’t judge me. However some good morals isn’t such a bad thing. At this time anything seems to go and not much morals these days. Its ok to do anything. Its ok the have lots of kids with out marriage and family. No fathers helping with the raising of the kids now. Lots of welfare but that dose not make a family. The language use today is so sad. There is no modesty anything goes. Was things perfect in the past no. But there was rules. Now there is the rules anything goes. I’m sure you don’t agree with me. However I hope you still have a great day and I hope you the best. We are based​ on freedom of religion. It is a religious themed park, but also a public attraction. We honor other religions. Allow them to honor us. If nothing else this is an amazing feat of work to be admired. He has as much right as the owner of his park, as the owners of Disney world. Now may GOD flood the earth and drown ALL liberals! Funny but I’m a liberal and a creationist. I’m sorry but you cannot be a godly man if you are a liberal baby murdering DEMON. I am also Pro-life. II am Socially and very politically a Liberal. I however am very orthodox theologically and dogmatically. In Christ alone by Grace alone, through Word alone, in Faith alone. I accept the authoritative Word of the Scriptures, and hold my Baptism to be sacrosanct. The Confession of Faith. You may want to research liberal views. They are not in keeping with Christ most of the time. I used to think I was liberal, but not for abortions, etc. I find conservatives much more in line with Christ’s teachings. Also I cannot be a bay murderer and a creationist. Use your thoughts before you spew your emotions out on me or any other you feel is evil. Consider the plank in your own eye first. Assumptions like these are what ISN’T making ANYTHING great ever again. Are you off your meds again, Bernard? Tom, I admit that you do have a very interesting point. However, the real difference comes down to the understanding of origins. Creation: All types are created by God as they are. A cat and cat kind are cats. A pine tree and all pine tree kind are pine trees. A Trout and all trout kind are trouts. An ape like all ape kind are apes. A human like all human kind are human. Not only that they are what they are according to their kind, they were always that way from their creation and shall be continuously this way. Now as for Evolution, all things became what they are today based on the ability to adapt to conditions or die off if they are too weak to adapt to environmental conditions slowly over time. beginning with “simpler” single cell life forms that progress into more “complex” life forms. Eventually according to this theory, the bacterium may one day after millions and billions of years of subtle change and adaption will become something like a tree, a cat, an ape, or even a man. The difficulty arise in this theory of evolution when upon more scientific examination micro organisms like bacteria and viruses, protozoa and others well are even more complex and sophisticated that some of the more evolved life forms such as fungi. Furthermore, scientific method requires observation, and duplication of experiments that can be shown the proofs toward the understanding of evolutionary processes. If evolution is a slow development over such a long period of time it will not be for a million or so years before anyone can duplicate the experiment to provide the proofs of it’s potential truth. In all and all the reasoning behind evolution in its first case was a philosophy set into Sir Charles Lylle, (14 November 1797 – 22 February 1875), a geologist and a Diest, proposed the concept of long development of geological epochs in the formation of earth and volcanoes. His concept of geological time was an influence on Charles Darwin, (12 February 1809 – 19 April 1882), hypothesis and eventual theory of Evolution and the “Origin of Species”. The two became life long friends. Both Darwin and Sir Lyell, posturized the idea of long control development of matter and life. Excellent and very intelligent precepts. However even in their days and still today it is all just theory . I grant them respect and appreciate the dialogue that they have made possible for us today. It opened us up to be able to ask the questions that were once suppressed and one dare not question the authorities of the time. Rabbi’s in Judaism encourage questions. were the dogmatic Roman Church, being the remnant of a totalitarian Empire, came down with the hammer on those who dared question the authority. Evolution can be fast – look at the different flu strain viruses. I’d point out too, the original created life forms possessed the genetic diversity to make all that exist now, so it would be very easily possible, if slightly different animals were separated by, say, continental drift (which could also have been much more rapid than now), they would “evolve” or speciate rapidly. NO BUT DUMP the tRUMP DONALD WILL if YOU LET HIM !!! Somehow I do’nt think that I should dignify you with a response. Faith is meaningless when one feels the need to defend it. WWJD? The Minister quoted in opposition of the Ark, said it is not good science. Well honestly when you take the look at the science in the exhibit and look at from the perception of a creationist and not an evolutionist the science works. Ken Ham and his team did just that. If you look at the “layers of time” in the evolutionary progress of epochs, Jurassic, Cretation, Triassic etc. etc. and depict them not as periods of millions of years but as the flow of a flood the surged from the deep sea inland and covered every thing with the torrent of waves moving rapidly over seabed and land stirring everything up , then depositing it all on top of one another in quick sudden layers upon layers. Just like the immediate petrification of Pompeii’s people when Vesuvius erupted. The Layers are not millions of years but Sudden dumps from points as far deep to far inland turned up and over each other. Where were you when science class was held? Hope you don’t drive a car because you in direct contradiction of science. Even the Catholics espouse evolution. I view science as a deeper understanding of God’s miracles and workings rather than as an opposition of God. All our technologies and medicines are based on science – what I call appreciation of God 101. As far as the job description, well, yeah, it’s a religious theme park not a Piggly-Wiggly! All of our thinking is ego-based, and ego is not part of God…it is almost like when we are not loving and caring, we entertain ourselves with intellectual constructs; they are all illusory, especially arguing the polarities of religion, politics, etc….. Thank you. I can understand this. The STATE is not trying to convert anyone to anything but the STATE. The opponents are non-believers who are jealous because they have no ideas of their own, so their opinion is suspect at the outset. They believe that socialism can actually benefit a society and abortion is better than abstinence or birth control and a disarmed populace is safer than an armed one, and there is a gene that causes homosexuality in spite of evolution, and that higher life-forms evolved from lower ones, and that carbon-dioxide and cow farts cause global warming, and Sasquatch is real, and pets go to Heaven, and your gender is whatever you want it to be, but not the Ark. Those who believe in the Ark are delusional. Read your bible, socialism was the idea of Jesus and abortion wasn’t only ALLOWED but it was CONDONED, especially in times of adultery. You may wish to actually READ the book you think you are “pushing”. LAY it ON HIM ALAN and JOHN OWENS ACTUALLY WHO DID WRITE the BIBLE,DO YOU KNOW ANYONE ??? Why is that so important to you? Who wrote I Ching? What about the Quaran? What about the Book of Mormon? What about the Urantra Book? How about Dyanetics? How many of these do you know the authors? How many do you consider authoritative or true forms of scripture? If you ask Tom Cruse, he may be able to answer this. Several men over the cource of about 2500 years give us the scriptures of the hebrew and christian text. Do you wish me to name them, Like Moses, Isaiah, Luke, Paul and John. Need more? Here is a hint: Why Pslam 46, and the 46 words in and out? He was 46 years old in 1611. It is the bible known well around the Globe. Gosh, JOHN MAHER, stop being so wishy-washy. …and you’re full of bovine excrement Alan. Sorry. You should read the book. It might flush some of that ignorance out of you. Alan, I challenge you to show me a verse that says abortion was condoned in the Bible. I also challenge you to show me where Jesus said those who work should support those who don’t. I would LOVE for you to tell me a scriptural verse where Jesus said the government should own the means of production. I’ll wait. It is another viewpoint, albeit out in left ‘interpretation’ field. An alternative interpretation can get the juices of thought flowing, if parenting is strong enough to explain all sides so a child can see the pros and cons of scientific fact versus conjecture. We all have our own determination of faith where Genesis is concerned – WORD of God, or word of man inspired by God? Parables are simply easy to understand explanations of what went before. Perhaps the only error in Ken Ham’s thinking is the age of the world, since we have evidence of the flood being so much earlier in man’s history. If he has done anything he has almost proved the engineering of an ark is possible. Now we just need a flood to put the controversy to bed. Couldn’t science be mistaken about the age of the planet? I’m just throwing that out there. The ark has been found, and the remains show engineering well beyond what humanity has imagined. Can you provide a link to the information on the ark that was found? All I can find it unsubstantiated claims. I have little confidence in youtube, but the Turkish military and government officials lend some credence. Trying to convert more people. I think it is very interesting and will undoubtedly attract a lot of visitors who do not believe in creationism. However, it is against the law to discriminate against people who do not believe. Actually it is not. being that it is a Park that is of a certain religious theme, it is an exception to the rule of certain beliefs. as in example a Roman Catholic Church is not going to hire a Jehovah’s Witness to be the pastor. Nor is a Sheikh Temple going to have Priest of the House of Satan preside over it’s form of practice. A synagogue is not in the habit of appointing Franciscans to teach its religious education for children. In cases like this there is an exception to the rule. ACTUALLY he should have made it SMALLER so he could PLAY WITH it in his BATHTUB, W T F !!! MUCH ADO ABOUT NOTHING, the MARVELOUS CHRISTIANS have BEEN PREACHING DOOMSDAY FOREVER, SO WHAT is the BIG DEAL if the MAN JUST WANTS to BE READY,SINCE DUMP the tRUMP DOES NOT BELIEVE in CLIMATE CHANGE MAYBE, JUST MAYBE KEN HAM has REASON. I see it as a new twist of theme parks built by a man with his on believes. I’ve studied the bible and come to the conclusion that this earth is 65,000yrs old.but that is my conclusion .amen. The replica ark is not as much about the age of the earth as it is about the plausibility of the Genesis narrative, It is about the flood, and the Story of God’s Creation. This Ark shows it was very possible to have been made.the true age of the earth is another story. Among other things, we seem to be arguing about whether the Noah story is true or not. Really, Christians should hope it ISN’T true, because it portrays their “loving” god in a very bad light. According to the story, God said, I’m disappointed in my people; they’re behaving badly, so I am going to kill them all, men, women, and children. This is hideous behavior on God’s part. Most of you say you oppose abortion, yet you condone, even applaud, a god who kills innocent children because he is disappointed in their parents. This is NOT hideous behavior on Hod’s part. Evil is hideous and God was destroying evil. That is NOT the same as aborting an innocent child! If you can’t see the difference…. I pity you. So the one-year-old children who drowned in the Flood were evil and had to be destroyed? Oh, and by the way, God didn’t destroy evil. Evil is still around, as we all know. What he did was execute a lot of people. Some of them probably had committed capital offenses, but I doubt if they all did. God killed them anyway. They were corrupt, and corrupting the Earth, like modern people. I think it’s wonderful that someone would Invest so much into something they wholhardley believes in. But I have issues with a state and local Governments involvement. I also have issues with the hiring practices and as I’m not familiar with State Laws for Kentucky I have to assume there would be issues with Equal Opportunity Employment. Must I sign a simular document to enter the park? No. I see this as a first amendment issue. He has just as much right to express his beliefs as the atheistic scientist. Let everyone draw their own conclusions. Even if people don’t believe the scriptures as the literal word of God, the Noah’s Ark story has been an important part of human history for thousands of years. Some atheist want to be heard but are intolerant of others who disagree with them. Would as many people be objecting if this were a recreation of ancient Egyptian society? I think all that money spent could of been put to a much better use. There are galaxies millions of light years away — a number that is not in dispute. The fact that we can see them, then, means that they have existed for millions of years. So much for the universe being six thousand years old. If they were created and placed in the universe all at the same time as in the the Genesis account, on the First day God created Light, on the fourth day he created stars, sun, moon and all the other celestial objects. Remember the Earth was there before even light. So the stars and galaxies are three days younger than the Earth or light. The point is is all was made at once then it will all be the same age. So you seem to have determined what a day is in time to God, wow . Sorry Thomas, not me. it in the scriptures. Only your interpretation of it. The scriptures say what they say. Private interpretation notwithstanding. So for the record, how many translations of the bible are there? In how many languages? How many revisions? How many interpretations of Greek, Hebrew and Latin words to English? I remember when gay was to be joyful – the meaning of words change over time, So for me to interpret God’s day to compare with mine seems ludicrous. How does one explain day and night before the suns shines or planet revolves? Or earth and water mentioned before there was a planet or water created? What is your point? They say pretty much what they say in all translations. You have missed the point. If a galaxy is a million light years away, that means it takes its light a million years to get to earth. So if we can see it now, its light started toward us a million years ago, which means the galaxy existed a million years ago. And a very good reason to leave the city lights at night and look up and stand in awe of God. Would God judge you based on knowledge of creation or on being a good Christian? In my opinion there is absolutley nothing wrong with building a tourist attraction. As for the question “Why would the state indirectly subsidize a nonsensible alternative to evolution?”. They’re not subsidizing a nonsensible alternative what the state is interested in is getting somebody to invest in and promote ticket sales which they tax and collect as revenue. Also if science is so concerned about about my child and how non sensible things can affect their mind where are when I took mine to see Superman the movie? To me the six thousand year thing sounds a little kookie but hey if it helps him sleep better at night go for it. Good point about the Superman movie. I would like to visit this monument. The Ark of Noah has slways facinated me. I am not a fundamentalist, but I respect their opinions. This exhibit most likely will not change any core beliefs for me, but would be marvelous to see. The flood story is found in many ancient texts and has influenced many cultures. Next time I travel though Kentucky, I will check it out. As far as state money, I’m glad they are helping fund entrepreneurs regardless of their beliefs. As far as hiring practices, so be it. Live and let live. The God of Compassion smiles on all of us! Again we are reminded that the most dangerous object in existence is the Holy Bible. It is the most scrupulously and meticulously studied document ever and yet, the same old arguments seem ever fresh. The real tragedy connected with attempts to literally ascribe Biblical “truths” to physical phenomena lies in our hegemonic notion that we may somehow grasp the mind and intentions of God. How dare we even assert that the universe is knowable to us at this point in time? In Biblical times humans KNEW that the universe was totally Earth-centric. A century ago, astronomers KNEW that the Milky Way galaxy comprised the entire universe. BTW, other religious and folk traditions include accounts of a global flood, some of which pre-date Genesis. The geologic record speaks to this flood as well, and has been used by “Christian Fundamentalists” to corroborate the Bible’s version of the event, and yet that same record contains within it evidence of billions of years of the earth’s existence. You forgot 60 short years ago science just knew the universe was eternal. Today we think evidence suggests that what those desert sheep herders wrote several thousand years ago is true, the universe did have a beginning. Today NASA thinks the source of the universe is something they call ‘quantum fluctuation’. I have always called the source Yehovah. Whats cool about that is both are defined in the same manner, both are non physical, both act upon the physical, both are eternal, both created something from nothing, both predate the universe. So much we dont know. But I agree with your thoughts that science has shown evidence the earth is much older than 6k years old. Unless I cherry pick verses, I find nothing in the bible that suggests only 6k years old. It this considered a religious theme park in the same sense as being a “church” or is it simply a for profit park like Disney Land or White Water? Although I have no interest in visiting, it is impressive. It is quite a feat. However, it is based on an obvious untruth. The earth is billions of years old (not 6,000 years old) and the Bible directly references dinosaurs as “the beast that was (ie/prehistoric) and is not (ie/extinct) and yet is (fossil fuels). Such a description leaves no room for doubt as to what is being referred to. I think the words, “Christian” and, “theme park” should never be combined. If the owners of this theme park were true to their faith, they would have spent the money used to create the park to help the poor and down-trodden. The fact that this park, (and mega-churches), exist disgusts me. Don’t be shortsighted….. this theme park will attract the multitude and the proceeds will be able to fun enormous good!!! That is what I think will happen, Marsha. What is amusing about a giant ark? Isn’t an “amusement park” supposed to amuse people? Frankly, I see this as just a stunt. A self-aggrandizing “see what a good deed I did” stunt. Ego. There are far better uses for this than as an amusement park. Convert this into a giant homeless shelter or food bank. Instead of mega churches, build mega low cost housing, or mega farm cooperatives. Actually do some good for your local needy people instead of greedy people. There are always socialist-minded people who say stuff like this. Just out of curiosity, what are you doing to help the homeless? There was actually a fascinating documentary I believe it was either an episode of Nova or Secrets of the Dead both series found on PBS which sees plenty of financial support from the people of the old testament.This episode was all about the Flood myth and that it clearly predates even jewish culture. It seems that there is ample evidence of not one but countless large floods through out the middle east in ancient times. There also was the discovery of a very ancient clay tablet written in cuneiform predating all judaism and actually all other writings indicating the design of a real ark. However its important to know that this design is very different then the biblical one, and its very likely that the description in the bible is a classic case of information becoming incomplete and altered by misinterpretation. These real arcs likely where very large versions of a form of grass woven bowel shaped raft that used a technique also used in building homes. It is easy to imagine when looking at their design to see how if an area flooded they would simply ride the rising tides. As for those calling evolution a theory, no its really not and its only the fear of starting some modern holy crusade that keeps the scientific community from saying such. The ability to study the genomes of species, and DNA which has directly connected all living humans to the mitochondrial eve which does not mean she was the only female alive at that time, but does mean she is a direct ancestor. And know she was not a modern human but one of our proto human ancestors. Creationism is a dangerous and archaic view that is pushed down the throats of young impressionable children and needs to be stopped. Not by the hand of the government but by we the people who share communities with dangerous zealots who close their mind to science in the name of faith. Every living thing comes from the same source. Did you know we can even find traces of DNA in the human genome that has sequences useful in plants but in humans seems to serve no purpose? This tells us very simply that plants are the most likely earliest form of life, something like algae was most likely that first life born of acids and chemicals in the fury of a still cooling planet several billion years ago. There is nothing wrong with possessing faith in the unseen, to recognize that there simply will always be knew questions even as we answer old ones, but it must be grounded in the common sense of day to day living and the hard won knowledge generation upon generation of the best and brightest of us have devoted themselves to uncovering. For the record I do not need to believe blindly in my own form of spirituality because it is entirely backed by science. When Master Yoda spoke to young Skywalker in a fictional story its writers had no idea how right they where. The Force is all around us( The energy that composes all of existence at a sub atomic level) It binds us( the unified particle field) It is between you and me, between the rocks and the trees even the very air( everything is composed of elements that are connected by energy even the light is made of particles) Life creates it (it is now thought that many of the elements found on earth where not here at its creation but created through biochemical process) Makes it grow ( perhaps no more magical a thing in all of existence is there then how plants take the energy of light, and chemicals from the air and soil to create physical mass, literally 10s of thousands of tons of plant material are created daily on our world). More then that quantum physics strongly suggested that its only through observation that light waves choose to become particles. almost as if the very energy of existence is somehow aware of living creatures perception of it. Our senses of sight, hearing, and taste all are connected to the subtle vibrations that bond atoms into elements. We are each composed of mass that contains enormous energy. The scriptures tell us we cannot understand God’s thoughts or plans in many things. I will not even try to say what time frame one pre-genesis day is to God.Even if the story of Noah didn’t happen exactly as described it still has many valuable lessons in it. The whole theme is about faith and trust in God. As a Creationist, I do firmly believe the validity of building a remake of Noah’s Ark. In Separation of Church and State, how many government entities throw these same tax breaks and subsidies towards Evolutionist groups foundations, and sponsors of Evolutionist theory? Discussions about the Bible always devolve to two camps. Those who believe in the inerrancy of the Bible, and those who don’t. Here’s one of the best articles I’ve seen explaining the contradictions in the Bible, and why the argument still rages. I’m sure God was impressed with how he wasted all that money on his own ego instead of ministering to the poor and needy with it. There is a theory that is called creative evolution. It asserts that evolution is a process developed and used by God. This adheres more to a Deist point of view. It seems many argue strict literal interpretation or atheism. Just wanted to point out there is also some more moderate positions around.